What Happened To This Flattened Truck? 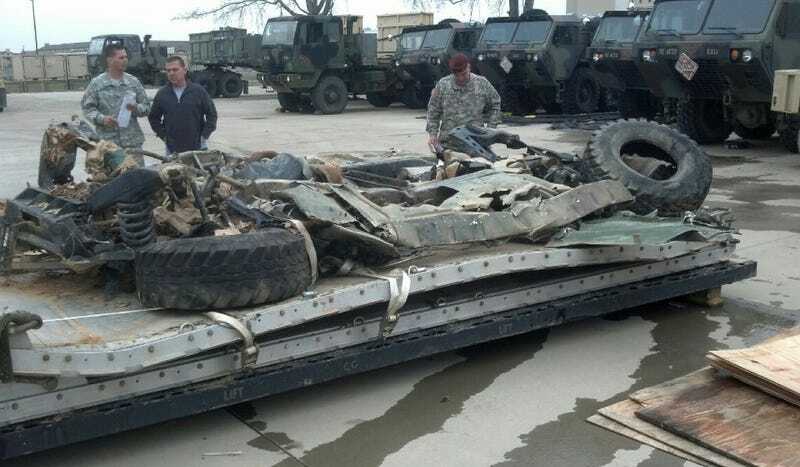 According to one poster on Reddit's r/JustRolledIntoTheShop, this is what happens when you drop a Humvee out of a plane and the parachute fails. We love r/Justrolledintotheshop, but we're still a little skeptical of this posting under "Stole this one from my friend in Afghanistan - Humvee had a rough landing." How high would the Humvee have to fall to make this strong of an impact? What's the terminal velocity of a Humvee? How did it land flat? What happened to the wheels? It's all a little hard to believe, but crazier things have happened in war.